Across the North Island, soil moisture levels improved dramatically during the past week due to significant rainfall. While large improvements were observed nearly everywhere, the most notable increases occurred in Wairarapa, where soils went from much drier than normal to much wetter than normal in only a few days. 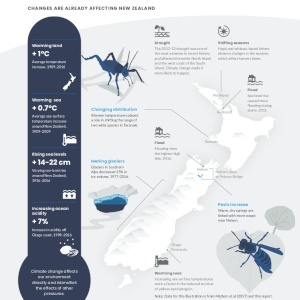 Nearly as impressive were improvements in the Coromandel Peninsula and western Bay of Plenty. Almost no locations in the North Island saw soil moisture decreases during the past week. The driest soils across the North Island compared to normal for this time of the year are found in central Manawatu-Whanganui, while the wettest soils for this time of the year are now located in coastal Wairarapa. All previous hotspots in the North Island dissipated this past week due to the heavy rainfall, including the largest one that had been located from Napier to Wairarapa. However, a new, small hotspot emerged in central Manawatu-Whanganui during the past week. Across the South Island, soils remained much wetter than normal from central Canterbury to Southland. In addition, substantial soil moisture increases occurred across Marlborough and northern Canterbury due to significant rainfall. Conversely, soil moisture levels decreased across Tasman and the West Coast. The driest soils across the South Island compared to normal for this time of the year are found in Nelson and northern Tasman, while the wettest soils for this time of the year are found in South Canterbury and coastal Otago. Substantial rainfall in the past week caused the small hotspot in northwestern Marlborough to dissipate, and no other hotspots are currently in place in the South Island. In the North Island, another week of substantial rainfall is likely in many areas, which could lead to further soil moisture improvements. Low pressure arriving off the Tasman Sea will bring significant rainfall to the upper North Island between Friday and Saturday (30th November – 1st December) with amounts of 20-40 mm possible. However, amounts will likely remain below 15 mm in the lower North Island. Some heavy showers and even thunderstorms will be likely from Sunday through to Tuesday, with localised amounts that could exceed 20 mm each day. A few showers may again occur on Wednesday (5th December), but amounts will likely be substantially lower that day. Total rainfall amounts in the next week will likely exceed 50-60 mm in the upper North Island (with isolated locations possibly reaching 100 mm), while the lower North Island and east coast will be in the 20-40 mm range. With substantial rainfall amounts anticipated in the next week, additional soil moisture improvements are likely in the northern half of the North Island. Soil moisture levels will likely remain constant or improve slightly in the lower North Island and east coast. The current hotspot in Manawatu-Whanganui may improve slightly, although a hotspot could re-emerge in the Mahia Peninsula. In the upper South Island, moderate rainfall may occur over the upcoming weekend (1st-2nd December) as low pressure moves off the Tasman Sea, with amounts of 50-75 mm possible. More waves of rainfall are expected early next week for the western South Island, with amounts in excess of 40 mm. By Wednesday (5th December) showers could also move across the lower and eastern portions of the South Island. Total rainfall amounts in the next week could reach 60-80 mm in northern and western areas, but 30 mm or less in the lower South Island. However, total rainfall in parts of Canterbury may remain below 15 mm. Expected heavy rainfall in the northern and western South Island should improve the soil moisture situations in those areas, particularly in Nelson and Tasman. However, soils may begin to dry at least slightly in central Canterbury during the next week. However, no hotspots are expected to emerge across the South Island.